If you couldn’t tell from the title, I’m a con virgin. Or at least, I was until New York Comic Con. Yes, it was my very first convention. And yes, I am a nerd. I wasn’t sure what to expect going into NYCC. I guess I was hoping that the con would be gentle with me. That it would assuage my fears and allow me to ease into things. God, was I wrong. There was no hand-holding, no warm-up period; there wasn’t even a scented candle. NYCC used me like a high school senior uses a freshman, and it didn’t even say “thank you” afterwards. Cons are rough. Don’t let anyone tell you otherwise. People who would tell you cons are easy to handle are like people who tell you getting a tattoo doesn’t hurt: dirty liars. But there was, however, something that brought everything to a screeching halt. Something that Meyer may have touched briefly upon in his post. I came to realize during my three-day stint at NYCC that the lines there are unique organisms. They are unlike those found in places like Disney World or at a concert. At an amusement park, you have to wait on line for the rides. But barring rare and unpredictable circumstances, you know you’re going to get on that ride. It’s only a matter of time before it happens. Likewise, at a concert, once you have your ticket, you know you’re going to get to see the show. In the end, it comes down to the matter of getting a better seat. But you still get to see the band (the same applies for sporting events). Cons are a different beast entirely. You are in direct competition with everyone else on the line. There are only a limited number of seats to whatever panel/screening you want to get in to. And, in most cases, the volunteers at cons — good-natured souls they may be — are too inept to cut off the lines in an orderly fashion. So you wind up with 300 people queuing up to get into a room that can barely hold 100. It’s not a line: it’s a contest. It creates strange pocket communities on a con line, I came to realize. You strike up conversations with the people directly in front and behind you in the line. You’re all waiting for the same thing, so you might as well make it enjoyable, right? And in all likelihood, if one of you gets in, you’re all going to get in. You become fast friends with these people, although they are quickly abandoned once you get inside the room. The people in front of you on line are the Lucky Bastards. They’re the ones who have the patience and foresight to get on line so ridiculously early that you can’t help but envy their certain seat at the panel. Conversely, the people behind you are Dirty Fuckers. You see, they envy your position in the line, and as far as you’re concerned, they’ll do anything to try and steal your spot and get into a panel they have no right getting into. As everyone knows, line cutters are the lowest of the low at conventions. 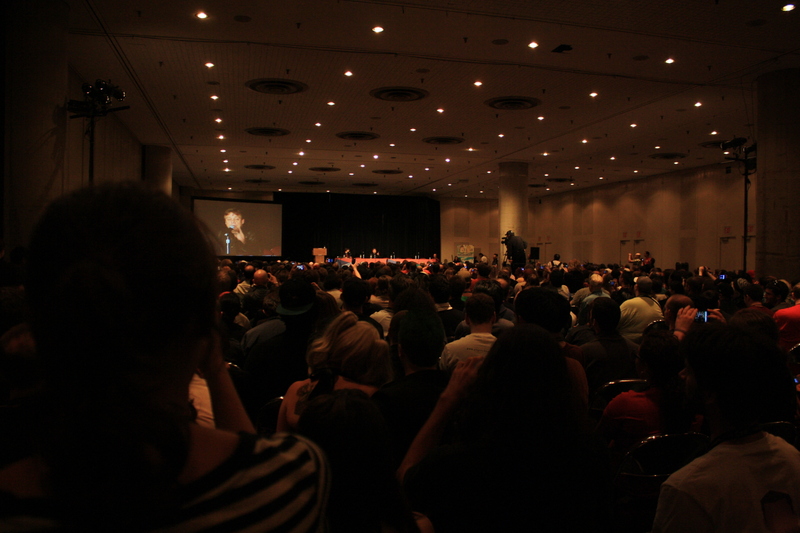 Ryan and I waited on line for at least an hour and got AWESOME seats to the Mark Hamill panel. One of the other things I realized at the con was that it’s really hard to classify what constitutes a “nerd” these days. At one of the panels I attended, a panelist said that nerd culture had been co-opted by society — that nerdy was now mainstream. At first, I thought he was right. But walking around the convention, I couldn’t help but look at the myriad nerds walking around. They were all types of people. Some looked like “typical” nerds. Others didn’t. It made me realize that, in our generation, everyone has a little nerd in them. Yes, some are nerdier than others. But nerd culture hasn’t been co-opted, it’s victorious! The fact that there are so many comic book movies being made these days, that video games are slowly becoming a new art form and that thousands of people attended NYCC says to me that nerds are now the movers and shakers of the world. We are all nerds, and we are legion. Also, where the hell are all of these hot, nerdy chicks I saw at the con the rest of the year? Are they kept in cold storage somewhere? My final point is HOLYSHITFUCK. It’s hard to distill exactly what “HOLYSHITFUCK” means in words, since it’s really more of a feeling. It’s the word I’m using to describe the feeling of being completely overwhelmed by NYCC, although it can really apply to anything. From the costumes (some of which were absolutely incredible) to the convention itself, everything was huge. There were thousands of people crammed onto the show floor, making their way between panels, stopping to take pictures — it was all so ridiculously grandiose that I’m still having trouble wrapping my head around it. The show floor was so huge that I got lost more than once. I found a booth on Friday that was really cool, and when I went back on Sunday to buy something, I just couldn’t find it. There was just so much stuff that I know I missed things. I think I would have still missed a lot even if I had another day (not that I could have survived another day). I went to panels and walked the show floor every day, and yet I feel like I did nothing — that I scarcely scratched the surface of what was being offered to me. I barely ate and I hardly slept. I was tired for three days straight. My body protested every movement I forced it to make. By the end of the day on Saturday, I felt like I just couldn’t go on any longer. But I did. For NYCC only comes around once a year. And this was my first con: I didn’t want to miss a second of it. So I shouldered my bag, grabbed my swag and hunted for merch. I meandered through the show floor, got bumped into and bumped into others. I listened to my feet scream in protest of every step I took, only to be drowned out by please from my stomach to feed it so I could have the energy to keep going. I’m still stiff, and my shoulder is still bruised from carrying my bag around for three days straight. I’m still tired, and there’s a sizeable dent in my wallet. And, after a lot of consideration, I can’t wait to do it again next year. So those are my impressions from my first-ever con. What about you guys? Do you remember your first? Let us know know in the comments.